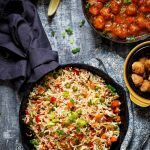 EASY VEGETABLE FRIED RICE | HOW TO MAKE INDO CHINESE VEGGIE FRIED RICE ? Vegetable Fried Rice - Cooked Rice tossed with Mixed Vegetables, Ginger- Garlic, Soy Sauce and Vinegar. Why Takeaway when you can fakeaway such an amazing Chinese Fried Rice at home in 15 minutes. Chop the Carrots, Green and Red Peppers to the size of Green Peas.Finely chop Spring onions separating the white and green and set it aside. Heat oil in a wok. Once heated, add garlic & ginger. Fry for just a few seconds. Add the white of Spring Onions, chopped red onions and saute for 2 minutes or so. Add the vegetable stock cube, Mixed vegetables, leaving the green peas aside for a little later. Saute in high flame, tossing for a couple of minutes, just enough to leave them crunchy.Add the green peas and saute them for 2 more minutes. Add Soya sauce, Rice Vinegar, Red Chilli Powder, Sugar, Pepper and needed Salt. Mix them well. Add Veetee Basmati and Wild Rice and stir fry with the vegetables for exactly 2 minutes. Turn off the flame, add the green of Spring Onions and serve. Serve them as it is or with a delicious Indo Chinese Gravy like Gobi Manchurian. ** Add Salt carefully as there is enough salt in Soy Sauce.